Ten months ago, 27-year-old Huyen’s destiny seemed written in stone – marry young, raise a family and work as a farmer to support them, like so many of her female peers living in one of the poorest parts of Kim Boi District, Vietnam. This is the reality for many women in Vietnam. Sport for development initiatives like ChildFund Pass It Back aim to empower young women – in rural Vietnamese communities with important leadership and life skills. The goal is to help these women overcome gender inequality and encourage them to reach their full potential. Below we talk about Huyen’s participation in the program as a coach, and how rugby has changed her life, vision and goals. Today, she is married with a five-year-old daughter, and supplements her husband’s income through her work as a corn farmer, but a world of new opportunities has opened up to her after being trained as a rugby and life-skills coach through the ChildFund Pass it Back program, which is implemented in partnership with Women Win and Asia Rugby, and supported by the Australian Government. “I consider myself so lucky because it is very uncommon for women to be allowed to attend any social activities after getting married,” says Huyen of the innovative sport for development program designed to help children and youth overcome challenges, inspire positive social change and ‘pass it back’ to their communities. For the one billion youth under the age of 24 living in 11 Asian countries where ChildFund Pass it Back eventually hopes to reach, opportunities are limited, not only to participate in organised sport but to learn important leadership and life skills. By giving young women and men the chance to come together in a fun and safe sporting environment – where they can be trained by coaches from their own community in their own language – ChildFund Pass It Back delivers an integrated rugby and life-skills curriculum, providing vital learning and development opportunities that will help them face the challenges of a fast-changing region. “Besides the curriculum, coaches usually share our own real experiences to facilitate life-skills discussions,” adds Huyen. This gives coaches the chance to teach the players life lessons from their personal experiences, and the players are able to draw upon the wealth of knowledge available in their community. Another key objective of the program is to address gender inequity and violence issues, which remain a challenge in many communities. As rugby is a relatively new sport in most Asian countries, there are no fixed ideas about who should play, which has encouraged high rates of participation from young women and girls. Females make up more than half of the registered players, aged between 11 and 16, and half of the coaches. As a result, the program is already reaching its goal of seeing more women and girls with stronger leadership and life skills. 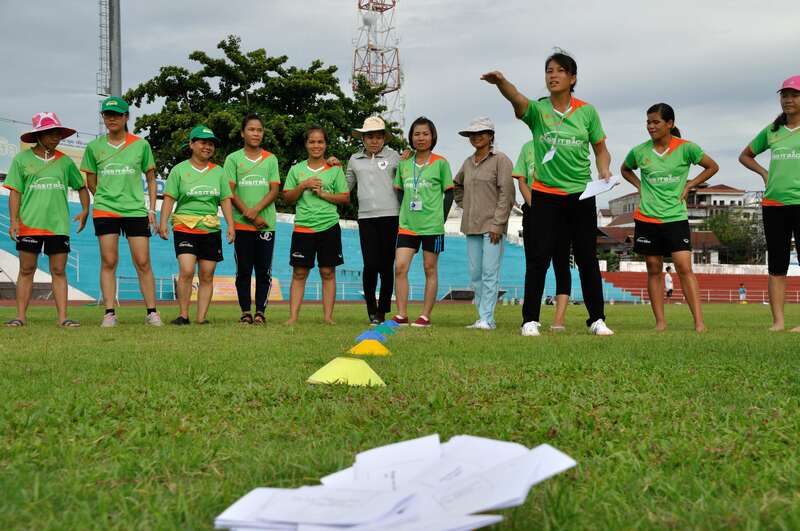 After rising fast through the program to represent the Lao Women’s National Rugby Team and work for the Lao Rugby Federation, 24-year-old Lao, from Nonghet district, has become an example of the power of sport to effect change for young women in rural areas. With rugby chosen for its promotion of strong values such as integrity, solidarity and respect, other coaches are also seeing the benefits of the ChildFund Pass It Back program. Our aim as a not-for-profit organisation is to protect the rights of children and youth worldwide. There are many other young women like Huyen, who can grow and learn as a rugby coach in our sport for development program. Your generous donation will give disadvantaged children in remote communities across Asia the opportunity to achieve their full potential through rugby.